CelebrityAccess (Nashville, TN) – Chase Rice has established himself as a no-holds-barred artist, as forthright on stage as he is off, constantly finding creative ways to engage with fans and deliver authentic experiences driven by music. Having launched his 2017 tour with back-to-back sold-out shows at the newly built House of Blues in Anaheim, Calif. and returned from a successful Canadian run, Rice veered off the beaten path over the weekend to play his first three “Pub Shows” at select venues throughout Georgia. Rice named the limited series of underplays after his own “Pub 44” backstage hang, re-creating the intimate, feel-good vibes of his early dive-bar-playing days. All three of the weekend’s shows in Rome, Valdosta, and Columbus, Ga. were packed to capacity as die-hard fans heard several new songs from Rice’s forthcoming studio album live for the first time. True to his word, Rice recently released the reflective new song, “If I’m Bein’ Honest,” direct to fans via streaming and digital platforms to give them the first listen and share new music with them immediately as anticipation for the new album continues to build. Rice penned the song himself while on tour in Southern California and was so inspired that he tracked down a local recording studio to record the song and release it – all of which he accomplished in less than 24 hours, from strumming the first guitar chords to releasing it into the world. “If I’m Bein’ Honest” is available for digital download now via itunes and spotify. Watch real-time video footage of Rice writing and recording the song on https://www.youtube.com/watch?v=YDWFJEepOAY&feature=youtu.be . Rice will perform his second series of Pub Shows later this week, with sold-out stops in Lansing, Mich.; Iowa City, Iowa; and Lincoln, Neb. 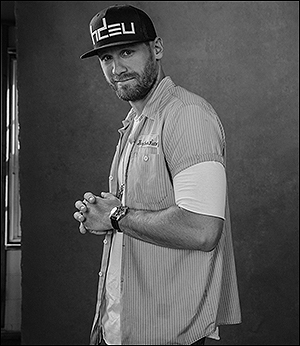 Within a few short years of moving to Nashville, country music maverick Chase Rice has already built a loyal fan base across the country through his energetic live shows and gained the attention of industry professionals with his edgy, eclectic sound. Rice’s RIAA Gold-certified Ignite the Night was released on Columbia Nashville/Dack Janiels Records and debuted at No. 1 on Billboard’s Top Country Albums and No. 3 on the all-genre chart. That album produced a pair of Top 5 hits, the Platinum-certified "Ready Set Roll" and Gold-certified “Gonna Wanna Tonight.” After supporting Kenny Chesney’s The Big Revival Tour 2015, Rice consistently sold out 2,500-3,000 seat venues on his JD and Jesus Tour and headlined his fifth tour, the Everybody We Know Does Tour, last fall. His new single, “Everybody We Know Does,” is available at country radio and digital retailers now with a new album forthcoming.